Last time I maxed out my credit card I was 15 years old and only had a $150 limit. It was easy at the time to use up such a small amount but it was a lesson that taught me I needed to plan better as I matured and as my expenses increased. That lesson panned out well as proven by the gradual limit increases. I learned the basics of credit utilization before many adults and keeping my credit utilization conservative has served me well. 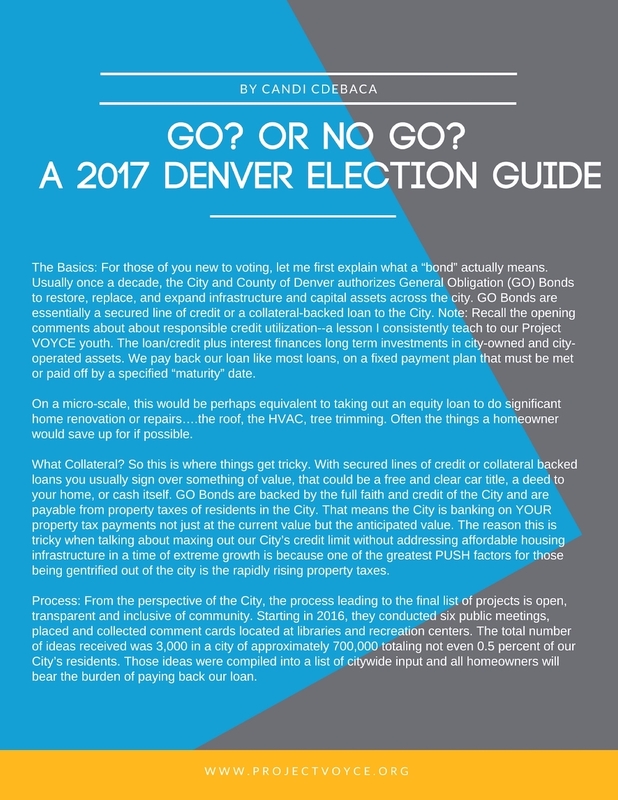 You can imagine my horror when reading a recent news headline, “Denver is “maxing out” its credit card with 2017 GO Bond, and housing didn’t make the cut.” I personally had been keeping a close eye on the GO Bond process but I hadn’t realized we reached our max and I hadn’t examined the final list of projects carefully. This headline and many requests from family, friends and new youth voters on how I would be voting is why I will share with you my personal thoughts on our City’s strong request for voters to support 2A-2G. This year our Project VOYCE’s Co-Founder & Co-Executive Director, Ms. Candi CdeBaca was given the honor of being a keynote speaker for Manual High School’s 2017 Graduation. Candi is a 2004 Manual Alumna and credits the founding of Project VOYCE to her experiences as a first-generation high school graduate from Manual. Please enjoy the thoughts and emotions she shared with her fellow Thunderbolts. While her words were specifically tailored to her Manual family, most of the wisdom is applicable to any and all graduates in the times we are living in today (live link). “Good morning Bolts and Congratulations on making it to these seats! This is truly the most beautiful sight looking out at your beautiful faces...looking out at OUR COMMUNITY beaming with pride and hope. When Manual re-opened after its closure in 2006 I vowed to come to every graduation ceremony from then forward to celebrate the legacy we and so many others fought to preserve. I am honored to have the opportunity to be with you AND share a piece of my heart with you today. My heart is is very full and very proud to be a fellow TBolt today. 13 years ago, when I sat where you are now, I hadn’t imagined the role Manual would come to play in my life. I graduated three years after Manual’s soul was shattered into the pieces of 3 separate schools and two years before they attempted to sweep up and toss out the remnants forever. As a first generation high school graduate like many of you----being a Thunderbolt has been one of the identities that has had the single most profound influence on my life. When I was in your seat, I remember feeling like graduation was my great escape. I had been told all my life to do well----Graduate----and go to college so that I could get out of the hood.I actually believed that narrative…. that I could ONLY do well if I left our 'hood'. Two degrees and 13 years later: I know now that they were all wrong. You all must do well NOT so we can leave our hood but RATHER so we can TAKE OVER our hoods. They are our inheritance and we cannot let another generation pass us by without claiming what is rightfully ours---That is not to say don’t leave for awhile. Go! See the world, expose yourself to every idea, city, state, country, community, person and opportunity that the Universe gives to you. Soak it in with your heart and mind wide open. It will give you all of the experience and knowledge you need to come home and be the leaders of your community that we need NOW more than ever. In 2004 as a graduate in your seats, I did not know about our rich Manual history. I did not know that I shared the honor of being a Manual graduate with the FIRST Black Valedictorian in DPS history, Ms. Zipporah Joseph in 1901. I did not know that Manual was the school that cultivated three black student leaders who, in 1924, led the first challenge to DPS’s segregation policies….a challenge they ultimately won in the Colorado Supreme Court. I did not know that Manual was the school that gave birth to the notion of “brotherhood” across race and ethnicities as the most diverse school of the 1930s. I did not know that Manual was the high school with the most future Tuskegee Airmen graduates in the country. Or DPS’s first black female high school principal---Mrs. Linda Bates Transou in 1986. I didn’t know and I hadn’t internalized the power and majesty of what I TOO was now apart of. Manual has produced Denver’s ONLY two Black Mayors---Wellington Webb and Michael Hancock, a national Latino civil rights freedom fighter---Corky Gonzales, and other leaders at the highest levels of government, cultural icons, and of course… the most special of all, the promise of greatness that will unfold in each of YOU. The Thunderbolt family perseveres like no other community in this City. Every day YOU challenge the status quo just by being you…by facing and overcoming adversity with grace...purpose…and determination. Society might have other ideas about you….And the only way to resist is to have YOUR OWN ideas and a critical consciousness. Dream big; think for yourself; and KNOW what from what dynasty you have emerged. Don’t wait for anyone or anything to give you the world you want. YOU are what we have all been waiting for. YOU have the right and the capacity to shape a better world for all of us. You are lucky to be living in such a pivotal time in history. The time is ripe for the talent and passion I have witnessed in each of you. I have watched your cohort stage Sit-Ins, Reformulate American Lit Curricula, Rebuild a World Class Theater Program, Lead Political Movements, Embrace Community and Re-Ignite School Pride that they tried to Extinguish. You are WELL equipped to take on the world. Use your critical eye to understand and deconstruct the forces acting upon your lives and communities always. Reject the systems that will try to keep us on a hamster wheel of oppression. Know when you are consenting to your own oppression and transfer your energy to empowering yourself and others. Refuse to buy into the games of divide and conquer that force us to do the dirty work for systems that benefit from our division. Reject the false idea that we are competing against each other for anything. We can create a new world when we look beyond the false divisions and see our future bound up in each others’....We are MUCH stronger together and that realization will be the key to our collective liberation. Add YOUR voice to the re-shaping of our nation that is occurring right now; question whose voice is missing; reach back and bring the missing voices to the table. And above all, make sure that you NEVER forget where you came from and what you stand for…what WE stand for….and what our ANCESTORS have died for. Whether you feel it or know it right now or not, YOU have a connection to your ancestors, it runs through your blood no matter how much the world tries to make you forget it…it is eternal, copied in your DNA. We are Queens and Kings and our histories began LONG before slavery and colonization. I say it again because it is the most important thing I will tell you today…NEVER forget where you have come from, NEVER forget the person sitting next to you. The day we stand together is the day we step into power that cannot be matched…and that is the day we can shape the world our ancestors dreamt for us. Strike on...brightly, loudly, proudly...And Like lightning itself, forge a bold new path through the clouds, and light the way for those to come...and ALWAYS do it the Manual way, with a BANG! 12th grade has arrived. You know what that means? Concurrent Enrollment. At the start of the second semester of my senior year, I landed a spot in a college English course. I’m an advanced writer and writing is something that I truly enjoy doing so I presumed that this class would be one of my favorites. On the first day, I came in early, found a seat near the front, and sat down eager to learn and experience the rigor of a college class. By the end of week one, the professor assigned us our first essay. He told us to find an advertisement and analyze the rhetorical devices being used in it. He didn’t provide a prompt beyond the verbal instructions he gave in class, but I was familiar with this type of essay and last year I wrote formal rhetorical analyses on complex texts like Frederick Douglass’ Learning to Read and Write and Martin Luther King’s Letter from a Birmingham Jail so analyzing the rhetorical choices of a print advertisement seemed straightforward to me. I found an ad, wrote the essay, and then took it to our Writing Center so I could get feedback and revise before turning it in. A couple weeks later, I scanned through the red comments that crossed out and questioned my own writing and found a “D” at the bottom. My heart sunk. That can’t be right. I talked to my peers, many of whom were in AP English Language and Composition with me last year, they all got low grades as well. Students in Manual High School’s AP English Language and Composition course (Fall 2015). The next essay came around and proved the first one wasn’t just an anomaly. Again, no prompt was provided. He told us to write an essay that analyzed how a toy from our childhood prepared us to later fulfill gender roles. He gave us a packet of photocopied texts from which we were required to cite evidence. After a painfully condescending speech about how our last essays showed him we do not know how to write at a college level or how to cite evidence, he typed an “exemplar essay” in class. For almost thirty minutes, we sat and watched as he typed an introductory and body paragraph. As his writing started to take shape on the projector screen, I revised his paragraphs silently in my head. The questions I would ask as a peer writing coach were running through my mind. However, I remained silent. By the third week, we walked into class and were greeted by the following warm-up: “Write about how and why you are failing this class. Why do you think your peers are failing this class?” He proceeded to tell us that of the almost thirty students in our class, the one student with a C holds the highest grade. At this point you might be wondering why am I telling you this story. It is not to vilify one professor or to complain about concurrent enrollment. It is to point out the injustice that minority students who make it to a college setting are left with the exhausting task of challenging low expectations. THIS IS A SHARED EXPERIENCE FOR STUDENTS WHOSE IDENTITY MARGINALIZES THEM IN THE ACADEMIC WORLD. Comments from a community college professor on an essay written by a Latina senior at Manual High School (Fall 2015). 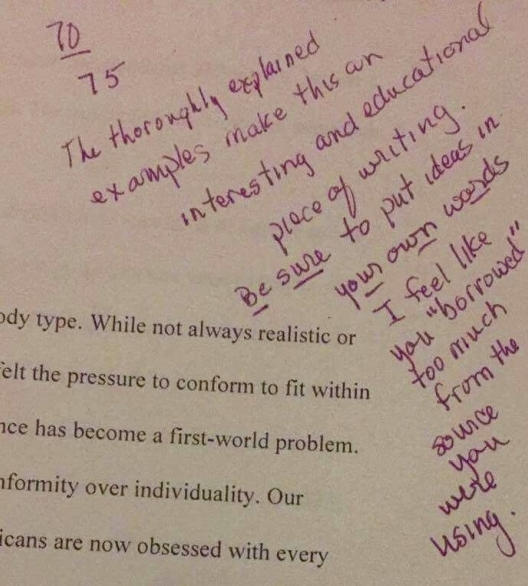 In Fall of 2015, one Latina senior at Manual in a concurrent enrollment English class had a professor write on the top of her paper, “be sure to put ideas in your own words.” When she confronted the professor and asked what that meant, the professor said “it didn’t sound like her words”; even though this was one of the first essays of the course and the professor could not possibly know what kind of writing to expect from her yet. Even our credibility as peer writing coaches in the Writing Center we built ourselves has been questioned. At the beginning of the year, the professor of my English class encouraged us to utilize our Writing Center by offering extra credit points to anyone who went there for feedback. A couple weeks later, after finding out that the Writing Center staff included many of students in his class, he retracted the statement and recommended we submit our essays online through the community college tutoring website because it could offer better feedback and support. Despite credentials, degrees, and tangible accomplishments, our value and capability in the classroom is forever in question. In my research to write this piece, I discovered many people of color are facing these types microaggressions on college campuses across the country. A Suffolk University professor’s comments on an essay by sociology student Tiffany Martinez. THIS IS DISCRIMINATION. THIS IS RACISM. MICROAGGRESSIONS AND STEREOTYPING IN COLLEGE LEAD STUDENTS OF COLOR TO FEEL UNSAFE MAKING IT MORE LIKELY THAT THEY WILL LEAVE COLLEGE EARLY. WE ARE FORCED TO BE OUTSIDERS IN HIGHER EDUCATION. A photo campaign featuring the voices and faces of Black students at Harvard College (2014). Being confident, resilient, and intelligent won’t be enough to protect me from low expectations in college. As I step outside of the tight-knit community of Manual High School, my last name and ethnic identity will make me a target of doubt. Institutions of higher education were not built for people like me and as a member of an underrepresented group, I realize that I will have to spend significant time and energy over those four years proving myself to my new peers and professors. A photo campaign highlighting the faces and voices of Black students at Harvard College (2014). As a peer writing coach, I get the chance to be a teacher. At Writing Center events, I share my voice as a writer. These experiences have made me feel powerful. Writing has became a form of authentic expression for me. The Writing Center has given me a place in the world of academia and within the Manual High School community, I am seen as capable and knowledgeable. I AM GRATEFUL FOR THIS EXPERIENCE BECAUSE I KNOW IT THAT IT HAS AND WILL CONTINUE TO GIVE ME THE STRENGTH TO RESIST INTERNALIZING LOW EXPECTATIONS, MICROAGGRESSIONS, AND STEREOTYPES. Peer Writing Coaches at Manual High School during their student-led day of reflection and professional development (Winter 2017). Feeling valued is fundamental to learning. Feeling a sense of belonging is fundamental to learning. If our educational experiences continue to tell us that we are in need of remediation or if the only way for us to experience academic success is give up our cultural identity, then school will continue to be a place where “more concertedly, persistently, and authoritatively than anywhere else in society” we learn how little value we hold. When they built the I-70 highway it changed the whole atmosphere. A lot of people left. People protested in the 60s against the highway going in the first place. But we got nowhere. And that is what we are doing again. We should have somebody fight for us. Our council members are not fighting for us. It really upsets me that our city is not standing up for our neighborhoods. My husband and I bought this home in 1981. We never wanted to move anywhere else. My mother in law lived 3 blocks away and my mother lived 6 blocks away. So, we were all connected. He always liked this house. Even as a child he knew he wanted to live in this house. When we were married and I was pregnant with my 4th child, my husband decided we needed a bigger home. This house was for sale and we bought it. My husband loved being in the yard. Tending to it. He was always planting. He loved beautiful things, especially flowers. Every summer he would remove the old sod and replace it with new. He would dig and dig in the dirt. By the end of each season the grass was dead. It never returned the next spring. Nothing stays alive here. I wonder if all of his digging in our yard and his work with the EPA testing soil samples in the area contributed to his cancer and death. I've lived in this area, on and off, since I was eight. My parents owned two homes--this one in Elyria, that I now live in, and one in Swansea, where my mother still lives. My mom will be 99 in June. I try to visit her daily so I can check up on her. Lots of changes have happened in the neighborhood. Many have not been welcomed. But, this is where I live and where I can afford to live. If I had to leave, I don't know how I'd make it. He works for CDOT during the week and is a pastor on the weekend in his old neighborhood, Elyria-Swansea. "The neighborhood has always been marginalized. We were all in the same boat—we got free lunches at school, even in the summers. We were all working class and the neighborhood is still that way. Our family had gone through some hard times. My Dad used to frequent the bars in the neighborhood. He would take my brother and I. We were only 6 and 7 at the time. We would hang out while he drank. We have vivid memories of walking our Dad home from the bars because he could not stand straight. We would walk down the I-70 viaduct, which was dark and scary. We lost our house because the money he earned went to the bars instead of our house payment. All 7 of us lived in a 2-bedroom apartment for a while. It was the kindness of one man, a friend of my Dad’s, who helped us get our house back. My Dad stopped drinking and began to go to church with the rest of us--that was a turning point for our family." Meet Jerome. He and Anthony are brothers and they grew up in Elyria-Swansea. "My mom has always been a church going person. When we were young she would drive us to church in SE Denver, which also had a school that I attended from 4th grade until I graduated. She would drive the church bus from SE Denver back to Elyria-Swansea and East Denver to pick up kids and take them to the Sunday school. Then when my brother and I got older, we started to do pastor work and drive the church vans to pick kids up. We wanted to promote what helped our family. After some time, it started to not make sense. If we wanted to minister to people like us we should be where people like us are living. That is what drew us back to our old neighborhood where our mom still lives—Elyria-Swansea. We see a thirst in a lot of marginalized communities not just Swansea. We know what the children in the community are going through. We’ve walked the same streets and path of having hard working parents on welfare and struggling to make ends meet." Historical context refers to the mood, conditions and attitudes of a time period. We often understand the significance of historical context as the way in which we move forward while being informed by our past. In our current political climate, we boast about our understanding of historical context and our knowledge of where we’ve been as a people. Simultaneously folks are making decisions that seem to be in direct opposition to a deep analysis of past moments of terror, and how such moments may shape and reappear in our future. It is crucially important as those who consider themselves to be part of the global movement against oppression to have a historical context for movement building and resistance struggles. In understanding moments of power and groups who organized themselves in a collective way, it is vital for us to read the literature that defines such groups. Some of the movements most inspirational to our work as young people are: the Black Panther Party, the Chicano Movement, L@s Zapatistas, and SNCC. Many of these movements defined themselves through their personal works like the Black Pather’s Ten- Point Program, El Plan Espiritual de Aztlán, and La sexta (Sixth Declaration of the Lacandon Jungle). In the spirit of understanding our historical context, we create our own, living, breathing declaration of our principles and our demands. "We the youth of Northeast Denver are here to liberate ourselves, our education and our communities to decolonize our minds." We DEMAND an equitable education that reflects our cultural heritage. We DEMAND healthy food options, not fast food chains. We DEMAND a path to affordable home and land ownership. We DEMAND safety from all threats. We have the right to build communal solidarity. We DEMAND communal, cultural celebrations in safe spaces. The Communities I grew up in are changing...... As I ride the bus through the East Side of Denver to the Westside, I see places of where I used to reside, all altered in so many ways. Parks turned to lots, lots turned to Skyscraping Apartment Buildings, My great grandmother's old home turned to a modern house that seems built for the Beach and looks like an episode of the Jetsons on the inside. Everything is changing, the mist cultivating and stripping my communities cultures block by block. Dear Gentrification, Do you Realize How much you steal? The Value of our homes taken and destroyed. People displaced and forced to move to Places like Green Valley which truly is just Colorado Projects literally keeping minorities out of the city. Gentrification has forced myself and many of my family and friends out of neighborhoods we lived in for decades. I believe it is unfair to simply take land that isn't yours especially when you already have more than enough. This is a call to action. Let's stand up for our communities! Stand up for our cultures! And fight for our Land! I ask of you please cease your spread, as money the antidote to your sickness is all too far from our reach. There are a lot of changes occurring in Denver, CO. Families are being displaced by CDOT, gender rights, planned parenthood funding, education funding, clean air, etc. Some of these issues impact us in a profound way, which cause us to rally around a particular issue. We fight, we raise our voices, and we plan, but what is everyone saying? Does the issue resonate with everyone that’s rallied together? There’s importance in being COHESIVE, meaning that a group is fighting, speaking, and contributing in similar fashion. According to Heidi Swarts, “Community organizing is the process of mobilizing people in the same geographic area to advocate for themselves in enduring organizations.” Swarts then asserts, “While affluent communities organize also, the term generally refers to organizing residents of poor and working-class communities into lasting organizations to gain power.” The keywords that I want to emphasize is “lasting organizations” “gain power” “poor” and “working class.” Lasting organizations can’t be authentic if they don't represent the poor and working class to leverage the power to other underrepresented community members. The goal is to provide the Globeville, Elyria, and Swansea (GES) community the tools to community organize effectively. By effective, I envision community members receiving quality training on maximizing spaces to create change for the betterment for their community. Often, situations in our community doesn't affect us until we realize how it affects us. We must choose to understand that standing idly waiting for the hard-pressed issues to end will prolong the opportunity for the people to mobilize themselves to advocate for positive change. 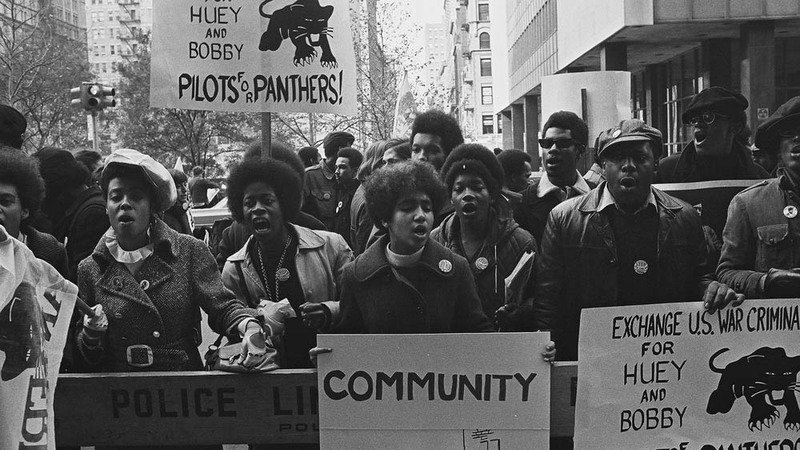 Why is language important in community organizing? Language, is the essence of which we communicate to achieve a bigger outcome in community organizing. There is strength in numbers but what are we articulating? For example, the social movement, Black Lives Matter, rallies to protest against discrimination and hate crimes that are often pinpointed to Blacks, which highlights overall minority oppression from all levels that should cease. In order to develop a lasting organization, organizers had to identify these three questions; What is the problem? How does it affect me and my community? How can we change? The point to consider is organizing would only last if there is a concrete foundation to educate and not perpetuate stigmas and societal marginalization. There’s an ever present urgency to be strategic about communal issues and moving towards change. “The pen is mightier than the sword” is not a new concept but it is a highly effective one. Rather than using hostility as our method of relieving oppression, why not use more respectable and viable options? Furthermore, in the spirit of social change in the 21st century, organizing is mobilizing to the extent of reaching and teaching the community to create change. How do we use language in community organizing? We use language in community organizing after being educated about the issue oppressing the community. Everyone that wants to organize shouldn’t depend on the lead organizer to be educated. We all must inform ourselves in order to break barriers that have encased minorities and limited the great feats they have the potential to access knowledge and create profound change. My earnest expectation as a youth leader is to see our community united with the will to conquer all barriers. We must not be distracted by the surrounding calamity, but focus our energy on building authentic relationships to build a coalition of radical leaders that are inspired to change the political world and spaces. In what has become one of the most important and widely regarded pieces of theory to come out of 20th century scholarship, Paolo Freire’s Pedagogy of the Oppressed recognizes the term “oppression” as, in a general sense, society’s social, political and economic inequalities. Therefore the oppressed are those who are most neglected and mistreated by systems of power. In our current moment of increased automation, militarization, and privatization of public resources, the oppressed are under attack from every angle. When it comes to understanding the role of organizations who work in support and defense of the oppressed, Freire’s development of action and leadership is central to the conversation. Freire does not solely highlight the ways in which the oppressed can actively organize against the oppressor, but also, he calls for a construction and defense of a pedagogy of the oppressed. As it relates to such a framework of understanding, Freire identifies the role of communities working with the oppressed, as well as the oppressed themselves to create and uplift this pedagogy. Communities working with the oppressed, in their most authentic and productive form, fit into the category of revolutionary leadership. Revolutionary leadership is dialogical. Dialogical action leads to liberation, for the antithesis is antidialogical, the very tool of oppression which, “reduces men to the status of things.” In order to actively reject imposition from the top, and rather encourage a liberating, dialogical approach, we must identify what the power dynamic is that exists. There is hierarchy developed around knowledge and possession of information. So often in spaces of youth development, youth engagement, mentoring and youth services, there is an ignorance of and a blind eye turned to the ways in which organizations of service to youth are inherently patronizing and antidialogical in approach, theory, and practice. We see the power dynamic produce and reproduce itself easily in the form of white, college-educated adults who do not live under the poverty line, serving poor black and brown kids in and around city centers. These representatives of the youth organizations are positioned as gatekeepers of the knowledge to be given to young people with discretion. Very rarely is the discussion centered at all around the inherent value and first-hand knowledge possessed by the oppressed- the youth being served. Dialogical action is the strategy Freire identifies as facilitating revolutionary leadership. In this way, the oppressed and those who actively commit to standing and working with, can come together to uplift the knowledge and views of those most oppressed in order to organize for their liberation, and therefore the liberation of the oppressor as well. The class which chooses to work with the oppressed but may not identify with them personally, demonstrates the way in which that class sees themselves as a real part of the movement in their current political and social context. This is not an easy, nor a passive process. It takes true solidarity. Solidarity as a concept has often been misinterpreted as mere support from one group or a person to another. We must, as a group attempting to build authentic, liberating relationships understand solidarity in the way Freire identifies it. There must be a departure of the oppressor from making “pious, sentimental and individualistic gestures,” and rather, we must risk “an act of love.” This act of love is only achieved through a real commitment to freedom, and adherence of the people and leaders of liberation. We must, therefore see our freedom as unbreakable and in correspondence with the freedom and liberation of the most oppressed. The people and the revolutionary leadership, together in dialogical critical analysis must work together to transform our current moment. My Name is Diaraye (Jarai) Diallo (Jalloh) and I am a sophomore at DSST: Cole High School. My mother came here from Conakry, Guinea in West Africa in 2000. Along with my older brother and sister, she came here and gave up everything she knew so she could provide better opportunities for her children. My single mother of four sacrificed her life and own well-being to ensure that her kids are receiving the best education possible. That is in fact not happening. What she changed her whole life for, has been rigged. As a young black Muslim woman and a child of immigrants my needs are being detrimentally ignored. DSST has failed in supporting their students of underrepresented groups. After 5 years of being established, in a school that is 83% minority and 71% free and reduced and lunch, this is the first time Cole has received a woman of color teacher. Our struggles that we face are not transparent to the heads of DSST. They placed a school in the east side of Denver and are incapable of sustaining the school in the way they have sustained other schools in wealthier neighborhoods. DSST wants to continue building schools in Montebello when they can't even handle the issues students of color face at Cole such as gang violence. DSST: Byers gets an adequate facility even though they are a younger school than we are. They continuously neglect our cries for help and pass on this façade that they are saving the poor brown and black kids from the hood. We sacrifice our school spirit and own teams because DSST cannot, for some reason, provide us with adequate facilities that they have for schools across other campuses. In addition to that, we have been placed in an old building. If you tell the heads of DSST about the inequity we face by being placed in a building that lacks air conditioning and many other things that many of the other campuses have, they will press the “historic beauty”. We are forced with the majority of our junior class being cut in half because of retention, dropout rates, and students moving to schools that do not perform as well as we do. They hold students back that have behavioral issues because they are concerned about not meeting the 100% college acceptance rate. There is no account for how many students are actually capable of handling college once they leave an institution like DSST. Students are withheld from advocating money to the rent of the building at Cole. Our clubs have to work twice has hard to make sure that there are the funds to actually do things that will get them into college. Our own CEO, Bill Kurtz, could only donate $60 to our debate team that needs close to 5,000 dollars. We lack in electives and honoring anything else that is not test based or STEM based. We are only provided with one language to learn that 60% percent of our students already know how to speak. Stapleton and Byer’s robotics team were clearly provided with more resources at our robotics competition. We are deprived of our own needs with labs and many of our teachers are forced to make cuts into their own paychecks to provide us with resources. For instance, a school like DSST: GVR has incubators, working speakers, lab equipment, and consistent janitors. There is even a lack of general cleanliness. We had a norovirus outbreak as result of the lack of upkeep within our school. We run out of lunch because we share the building with elementary scholars, lunch that many students depend on. We have systems like refocus (after-school detention) which are systematically racist. If you see who is in refocus it is only the black and brown kids who are being punished for things the non students of color are clearly getting away We get punished for things such as not having the right clothes on which students may or may not be able to afford, or being less than a minute late when our white students come later than that and are not being punished for it. As a result, there is no change happening for our students because we are seen as incompetent by our heads. Instead of supporting us, they are stunting our growth as individuals and as students based on our backgrounds and are failing. Woman holding a sign in protest after a rally for Donald Trump in St. Louis, Missouri (March 2016). TOP: Hazel Bryan and Elizabeth Eckford walking away from Little Rock Central High School when schools were desegregated in the south (Sept 1957). BOTTOM: Protesters and supporters at a Trump rally outside the Denver Convention Center (July 2016). All across the country people are protesting and organizing. There is a collective feeling of discontent and anxiety about the future of our country. Denver is no different. The narrative of innovation and progress confounds the long-time Denverite as we witness the haphazard growth of a city that is clearly ill-prepared to grow so quickly. Perhaps the most confused by the dominant narrative and the reality are the youth of our city, including and especially youth in underrepresented communities. For the past 11 years, Project VOYCE has trained, employed, and organized youth across the city. Never in our history as an organization has there been more demand for our work, so much so that an organization we narrowed our focus back to our original region in Near Northeast Denver. The youth living in this area arguably face the most uncertainty and imminent danger than youth in any other community of Denver. In an 84% Latino community with a 50% homeownership rate and 50% of folks who have lived in their homes ten years or more, one would think this would be a community worth protecting or insulating from the many changes occurring. However, for some of those same reasons, this community is being treated as expendable. With the highest rates of poverty, high rates of undocumented residents, low levels of formal education and some of the largest household sizes, rates of homeownership are easily forgotten. This community is suffering the same fate and threats as it always has; exploitation. Just last week the Denver Post recognized 80216 as the most polluted zipcode in the entire country, even more polluted than Love Canal yet simultaneously it is one of the hottest housing markets. Buyers are either not being informed about the contamination in the area or they are simply hoping to come in with a fresh coat of paint, flip, and cash out before anyone catches on. Meanwhile, youth and families in these communities have been raising concerns about soil and air pollution for the last few decades without much attention. In the last year, everyone has began to pay attention to the cries of suffering community, everyone except those with the power or responsibility to address the well documented and valid complaints of the people. The community’s struggles have been elevated to the New York Times, the Guardian, Canadian Broadcast Corporation, Congress for New Urbanism and even Washington Post. Youth and community have become impatient with the continuous string of broken promises and neglect from city officials, state agencies and officials and even congress. With the growth of the city on top of the existing legacies of injustice, the cultivation component of the Marijuana industry has disproportionately concentrated itself in these neighborhoods putting more drugs into this community than ever before. Located only 3 miles from the city's center the property taxes in the poorest community have seen a 68% rise in one year, no other neighborhood in Denver had a comparable increase. Additionally, the city will embark on a $2billion redevelopment of the National Western Center, an entity that has a history of excluding its surrounding Latino poor neighbors except to work concessions and clean. Perhaps the most destructive force acting upon residents in this area is the proposed expansion of I-70. This expansion will wipe out over 5% of Swansea's residents meaning over 200 people while deepening the wound of its original existence. The width of the structure will be tripled only adding toll capacity, eliminating the York and Steele Street exits while placing Swansea Elementary School’s playground atop the new 40ft deep gash of interstate. While those immediate and direct impacts alone are concerning, the longer-term impacts are riling up most folks including the young people who will pay the consequences of our current sins. Coloradans will pay 50% of our Bridge Enterprise Fund for the next 34 years for this 2 mile stretch of bridge. Residents in 80216 and 80205 will suffer the negative health consequences of a triple-sized freeway in their backyard. Those well documented consequences include 70% higher rates of asthma, cardiovascular death, cardiovascular disease, cancer and learning disabilities due to lead poisoning in the soil that will be disturbed. Needless to say, there is quite a bit to be “angry” about in Denver. Youth will pay the high costs of poor decision-making today. Youth will be responsible for digging themselves out of a poorly planned city if they choose to stay here. While decisions are being made swiftly with little regard for community or future consequences, youth in these communities are taking the lead from young people across the country who are rising up to ensure their voices are heard. At Project VOYCE, in partnership with other organizations organizing adults, youth are learning about youth’s role in all social movements throughout history and they are critically thinking and actively building a legacy of change themselves. From taking supplies to the front lines at Standing Rock to testifying in City Council on affordable housing needs, to organizing and educating community on the potential for a re-imagined tree-lined 46th Avenue Parkway instead of a tripled I-70--youth are identifying themselves as stakeholders who demand a role in shaping their future. So when you hear about the “angry protesters” know that they are a reflection of irresponsible leadership and be happy that they are angry enough to want something better for themselves and future generations to come. * Project VOYCE trains, employs and organizes youth to seek justice in education, health, housing, and environment.